Bitcoins. What are they? How do you get them? Where do they come from? Once the currency of choice for drug dealers and computer hackers, Bitcoin has broken into the mainstream. Countries have officially begun recognizing and regulating (or outright banning) it, and even the IRS got in on the game for this most recent tax season. With the announcement that popular point-of-purchase company Square will soon be accepting Bitcoin, it’s only a matter of time before you can use the mysterious currency to purchase paper towels at Target. But even with this growing acceptance, Bitcoin remains a somewhat confusing mystery. What are they? How do you get them? Where do the come from in the first place? I asked Ian Dixon, the Founder and CEO of the mercenary Bitcoin-mining-for-hire operation WeMineCoins.com, to shed some light on all things Bitcoin. Dan: So you’re CEO and Founder of WeMineCoins.com. You’re a Bitcoin miner. What exactly is that and what does the mining process look like? Ian: Bitcoin miners are the ones who secure transactions done on the Bitcoin network. The process is more about making sure the equipment is running smoothly. It looks like a bunch of typically loud and hot computers running 24/7! Dan: And you guys are doing this for hire then, right? Ian: Yeah. We mine for ourselves, of course, but there are also some changes in the mining market that I’ve noticed: big players that have started to make massive operations. We thought it was important to make sure there was more competition out there. Dan: Make sure that there was more competition with the big guys? Ian: Yes, because basically what’s happening is mining is starting to centralize. Most of the hashing power – mining output – is controlled by a small handful of massive mining operations. If centralization is going to happen in that regard, as opposed to everyone mining in their bedrooms, then I think it’s extremely important that there are multiple companies out there. And they need to be competitive with each other. That way the average person, who doesn’t want to drop $100,000 on mining computers, can get in and start to have a vested interest in the mining economy. Why is the Mining Economy Important? Dan: What is the difference between having a vested interest in the mining economy versus the Bitcoin or “alt coin” economy on a broader scale? I own Bitcoins, should I also care about mining? Ian: That question spreads across a couple different currencies. Let’s talk about Bitcoin first. I think it’s important for a bunch of different people to have a vested interest in mining, specifically because Bitcoin was designed to be decentralized. In some regards it has become centralized because of behind the scenes reasons, like one big player who buys a million dollars worth of equipment. Individuals likely won’t do that very often. We at least have to make sure there are many, many, many big operations. That’s the way that you offset too much centralization. Let’s say, like right now, there are only a handful of really big mining operations across the planet. If that’s the case, and it seems like it is, then I think we need more, large-scale operations in multiple countries so it’s still, by extension, decentralized across the planet. Dan: Who are the big miners right now? What countries have a higher concentration of miners? Ian: I think the United States has three of the biggest mining operations on the planet. I know for a fact at least two of the biggest are here. There’s a huge one in the UK and I would have to do a little bit more digging to see if identifying others was even possible. 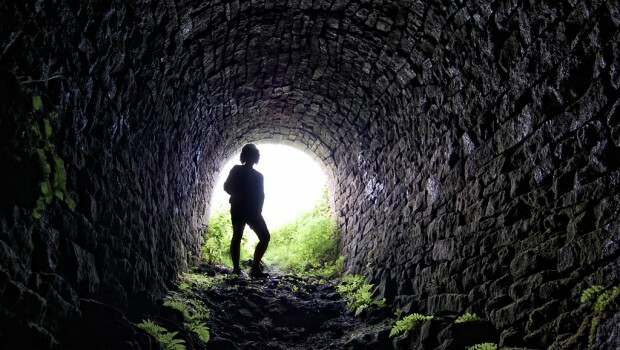 There are some things that you can do to obfuscate or hide the fact that you’re a mining operation. It makes it hard to definitively identify everyone. Dan: How does your business model work? Based on my understanding of mining, most people do it for themselves. They keep the coins and then they either transfer it into other currency or they trade it as a commodity. If you’re selling your services as a mining operation, how does that work for you as an organization, and then how does that work for the people who hire you? Ian: One of the benefits of being a centralized, very big operation is that we can buy hardware in bulk. The theory is that we’ll be able to get it for cheaper than when you make small orders. Our business model is set up so we can be competitive with pricing and pass those savings on to our clients. Once you get to a big enough business model, mining operations have the capacity to sell action cards, which a person can mine and get coins for a cheaper price than you could go out and buy. Now, there’s a lot of behind‑the‑scenes stuff on what makes that possible, and it depends on the business model. Clients can lease that hashing power cheaper than they could otherwise obtain it individually. Our business model is to start at the smallest scale and then build up as high as we can go. We’ll continuously offer that speed for individuals at a low price that’s competitive. Dan: So, because you’re dealing with economies of scale, someone take out a mining contract with you and get Bitcoins for cheaper than they could get them on the open market. That sound right? Ian: Exactly. Yes. We’d be able to pass on savings like that. Dan: I know this is kind of a moving target and so it might be tough to answer, but what is the difference between the price I could get a mined Bitcoin through you, versus what I could get on the market? Is it a 10% difference? 5%? Ian: That’s not really possible to answer. It’s not secret information, so don’t think that. It’s just there are too many factors at play. Are you familiar with what a futures market is? Dan: Yeah. Basically a bet that whatever I buy now will be worth more in the future when I receive it. Ian: Mining isn’t exactly the same, but it’s a decent comparison so people get what’s going on. Mining is kind of like a futures market for Bitcoin. If you buy a mining contract or you’re mining Bitcoins, in a way you’re betting that you’ll get more coins for the same price than you would get if you just outright purchased coins now. Dan: Yeah, that makes a lot of sense. Ian: Just like with a futures market, you have no idea. That’s why it’s a market. If you knew for sure, then it wouldn’t really be a market. Is Bitcoin a Commodity or a Currency? Dan: Do you see Bitcoin predominantly as a commodity or as a currency? If you had to pick one, what would you choose? Ian: That is an awesome question and I’m going to totally dodge it. Here’s what I think Bitcoin is. I think it is a decentralized currency. The reason why I think it is a decentralized currency is because by most legal definitions a currency is issued by a centralized authority. Bitcoins function as a currency, but are decentralized by design. Digital currency is a cool name, but digital currency doesn’t really fit it. PayPal has a digital currency. When you transfer $100 into my PayPal account, visible cash is not moving. PayPal doesn’t physically have to move cash for that. They have an internal accounting system, that I would say is basically the equivalent of a digital currency. A lot of this is philosophical, but if you want to really get down to it, I think that falls more in line with what a digital currency would be. There are also people making further distinctions. For example, that a virtual currency is something else entirely and only exist in video games. Something that’s virtual. Ian: Right. Now commodity… China says that Bitcoin is a digital commodity, but in my opinion it’s not a commodity. It’s a currency. But what type of currency is it, then? Because it’s clearly not a typical currency. So I would say it’s a decentralized currency. That’s the term we go by. Dan: Do the economics of it all change if the definition changes as well? Ian: How governments decide to treat it in the legal system will definitely change, based on the legal definition. I would say yes. Dan: Yeah, the IRS just ruled that it’s actually property, right? Ian: Specifically, what they ruled is that it’s treated as property for tax purposes. They’re not calling it property. They’re saying for tax purposes, we treat it as property. They’re not labeling Bitcoin as property, which would have completely different implications. Dan: By them labeling it as property only for tax purposes, does that continues to leave the door open a little bit for other uses? Ian: It’s totally a new thing, so most governments are not on the same page about what they’re calling it, even within their own borders. Like, portions of the US government have referred to Bitcoin in official documents as virtual currency. Sometimes they’ve called it digital currency. A couple of days ago the US Treasury called it a decentralized currency. But there is no stance on it yet. I think we’re kind of at the whims of whoever they have type up the document, I guess. I don’t really know what’s going on there. Dan: Do you wish they would just pick something and stick with it? Or do you like that it’s in flux right now? Ian: It’s probably good that it’s in flux right now. We sense that it’s something so new and governments are so big and slow to react to things like this. If they picked something, it would have far reaching implications that may not be resolved further. I’m not in a huge hurry, and I don’t think anybody else should be in a huge hurry for it to be defined. I’d rather have them define it correctly and come up with appropriate rules for legitimate businesses who operate within their borders and using decentralized currencies. 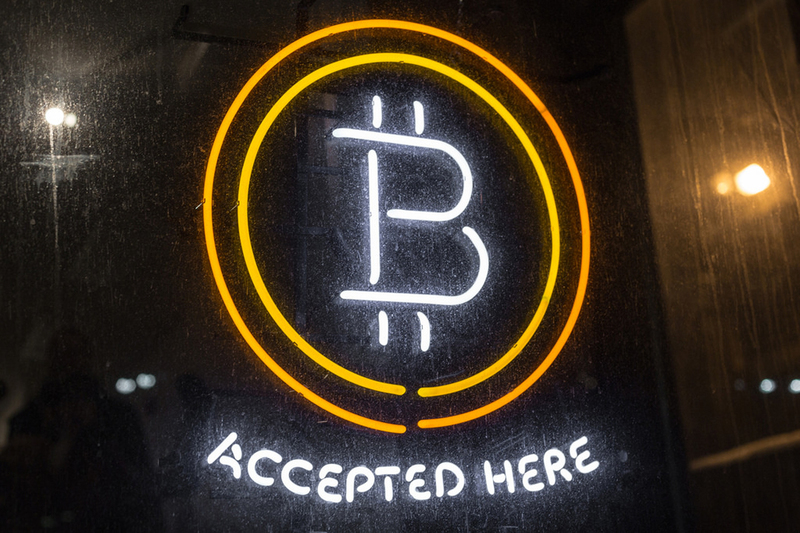 Dan: Speaking of legitimate businesses, what is your take on the news that Square will be accepting Bitcoin? Is that good or bad? Ian: Yeah, we need that. Right now, a lot of people I talk to take the opposite approach, they take the Bitcoin can’t succeed until people use it approach. They’re like, “Well, not enough people are using it yet.” I actually take the complete opposite stance. I take the stance where it’s going to be harder for it to succeed until merchants accept it. Because it doesn’t matter if people use it if merchants don’t accept it. That right now we should continue to do what the community is focusing on and getting merchants to accept it and payment processors like Square to accept it, so that framework is there for people to use Bitcoins once they start using it. Dan: Yeah, it really does. I have some Bitcoin, and I have no idea where I can use it – I can’t use it at the grocery store yet. Dan: Ok, hypothetically let’s assume we have merchants who can accept Bitcoins, how would I go to these merchants and actually spend it? How do you foresee those transactions actually taking place? Should Bitcoin be loaded on a credit card or…? Ian: I don’t like that idea. It sounds cool, but I don’t like it because in the ideal world you would never have to convert Bitcoin to another currency or another value. If I’m a merchant, I accept Bitcoin and I can hold Bitcoin. That’s the ideal system. That is totally not going to happen overnight. There are still many years to go, in my opinion. I think the path of least resistance is getting merchants to directly accept it. By the way, Square is an awesome start to this because it doesn’t cost the merchant anything to do it. If they already use Square, fantastic. It’s minimal effort to start accepting Bitcoin. It’s minimal training to start accepting Bitcoin. Dan: How would you see that transaction working? Square is partnered up with Coinbase, right? Ian: I believe so, yeah. Ian: With all the point‑of‑sale systems we’ve seen so far, they basically create a QR code. Are you familiar with QR codes? Ian: It creates a QR code which contains the address information and the amount of Bitcoins to send. The customer will use a mobile app that scans the QR code. On their screen, they would see, “the wallet address and the amount of coins to transfer.” If they confirm it then it gets sent. It’s going to evolve more capabilities in the future. There will be more options, like some sort of NFC, or Bluetooth. There will be other options like swiping your device. That’s pretty likely to happen. I haven’t seen it, yet, but it’ll happen. Dan: All that technology exists, right? It just needs to be baked in. Ian: It’s all in place already. We just need somebody who makes it actually happen and it’ll be there. Dan: I can see that taking off all over the place. Especially with Android phones since they all have NFC chips built in. Dan: Ian, what’s your background and how did you start mining Bitcoins? Have you ever looked back? Ian: Have I ever looked back at it? Ian: My background is basically information technology. Computer hardware and server setup – stuff that I did in college. Then I took business classes. I’ve always known that I wanted to run my own business and I’ve always done this or that to make money. I used to refurbish laptops and sell them on eBay when I was a teenager. I sold XBoxes when I was younger than that. I’ve always wanted to do my own thing. One day, I read about this Bitcoin thing. I didn’t know anything about money at the time, I don’t think most of us really do. No matter what we think, most of us have no idea how money really works. At the time, I didn’t really care about Bitcoin as a currency, but I saw it as a way to make a living from my computer skills. It seemed like a very low resistance way to do that. I had a conversation with a friend who had some money, and he said, “Look, I trust you. If you think that you can do this, we should probably try it.” He gave me some money to try it and we did that for a little bit. Ian: One moment I was sitting on Bitcoins worth a hundred dollars, and then over the course of a month or so their value increased by 10x and I had a boatload of money. My partner and I had gone separate ways at that point, so I decided to launch mining as a business on my own and I haven’t looked back since. It’s really interesting how things have changed. Dan: That’s quite a story. How much did your first rig cost? Dan: What do your rigs cost now? Ian: The cheapest machine we buy is $2,200 right now. The most expensive machine is $11,000‑ish and up. Dan: That’s crazy. How does the hash power of your first rig compare to the rigs that you buy now? Can you even compare them? Ian: It’s hundreds of times faster… Almost laughable. It’s so much faster now and it only uses the same amount of electricity as one of the graphics cards used to. It’s unbelievable. Dan: I forgot that electricity is an operating cost you need pay attention to. If you’re spending more money on the utility bill then you’re getting back in Bitcoins, then you’re operating at a loss, right? Ian: As a business, there are some interesting ways that we can get around that, too. We own enough equipment ourselves that we can even out that volatility to a point. But there’s still a level of risk we’re willing to absorb. If the operation wasn’t profitable due to electricity costs, we could cover that with extra equipment. Or we can cover the electricity with our cushion of Bitcoins if the cost of electricity goes too high. When I first started mining in 2011, there were months where we didn’t make money. But there were also days where the value of Bitcoin would increase 75 percent within an hour. That profit made up for the previous losses. It was far more volatile then, than it is now. By orders of magnitude. It’s much more stable now. We laugh when people say it’s not stable now. I remember watching the price go from four dollars to a quarter in the course of an hour and then shoot back up to two dollars before the end of the day. And it was normal for that to happen. It takes months for changes like that to happen now. If the stability of Bitcoin continues to progress at this rate, then I’m not concerned for the future. That’s not a guarantee, but that’s how we look at it. Dan: I guess when you’re used to those wild fluctuations, the current situation looks rosy. Ian: 2013 was a very, very, very different year for how volatile Bitcoin was. It was very different. I can’t speak for the other Altcoins, though. Some of those are crazy. What’s the Deal with Altcoins? Dan: What is your opinion on all these Bitcoin alternatives, “Altcoins”? Are there too many of them? Should they just get out of the market? Is it good for decentralized currencies as a whole? Give me the download. Your goal should be merchant adoption. For merchants to adopt it, really big ones like Amazon and Overstock.com, there needs to be a minimum amount of liquidity in the market. This level has to exist for markets to function. Based on the current state of other Altcoins, Litecoin is the only one that has enough liquidity for a merchant to adopt it. If somebody like Amazon decided to accept these other coins, they probably wouldn’t work out well. The economic pressure would destroy the coin. Litecoin is the only other viable digital currency right now. Some of the other coins have cool properties, but none of that really matters. If your goal is to support a digital currency for merchant adoption then these other coins won’t work. 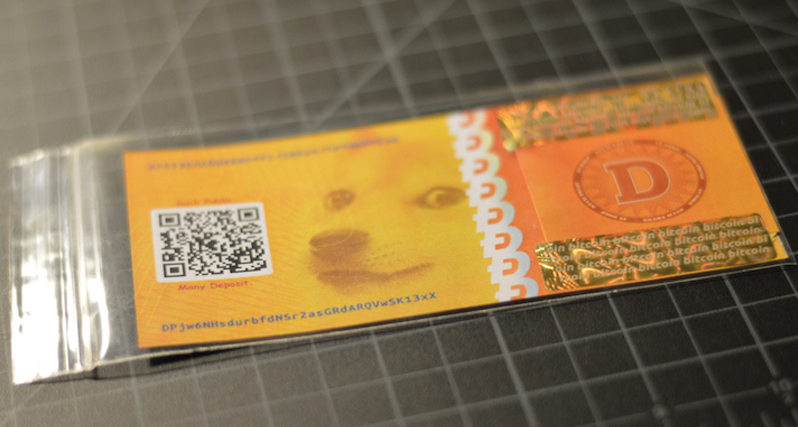 Now, an interesting one that you might laugh at when I mention it, is Dogecoin. It’s extremely fascinating because…well, it’s a coin with a dog on it. It’s weird that we’re having a serious conversation about it, but the reason why I like it is because it’s opened up the idea of decentralized currencies to a larger demographic. Generally speaking you can profile most people who like Bitcoin as libertarians. This turns off a large group of people on the planet, because not everyone is a libertarian. If one of the issues with digital currency is mass adoption then turning-off everyone who isn’t a libertarian is a big problem. It’s not the fault of digital currency. It’s really just a branding problem with Bitcoin. It became associated with a certain group of people from the onset and this created an acceptance issue for everyone who wasn’t part of that initial libertarian group. Then Dogecoin came along, and they basically solved that issue. Decentralized currencies used to be the realm of developers and IT professionals, both predominantly male vocations. But I’ve met more women who know what Dogecoin is than who know what Bitcoin is. So right off the bat that brings an entire gender to the table who currently wouldn’t have otherwise cared digital currencies. In general, the other people that I see using Dogecoin aren’t nerds. They’re not even necessarily tech‑savvy. Some of them are, of course, but Dogecoin seems to appeal to a wider spectrum. Maybe because it has a dog on it. I don’t know, but it’s working. Whatever they’re doing, it’s working. Dan: It’s approachable and it’s not associated with buying drugs or a hitman on The Silk Road. Ian: Yes, so that’s good overall. Whether it succeeds or not as a currency is something I don’t really care to speculate on. It’s succeeding at getting people to adopt decentralized currencies, and that’s great overall for the whole economy. Dan: You said a couple minutes ago that you felt like you didn’t know anything about money when you first started mining. You sound like you know how money works now so what was that journey like? What flipped the switch for you? Or was it a long slog through the mud? Some coins operate on theories like limited supply. I still don’t know if that’s a good or bad idea. We’ll see. Bitcoin is like an experiment in that sense. We’ll see if it works out in the free market, but the idea of at least controlling inflation is a great idea. It’s a fantastic idea. 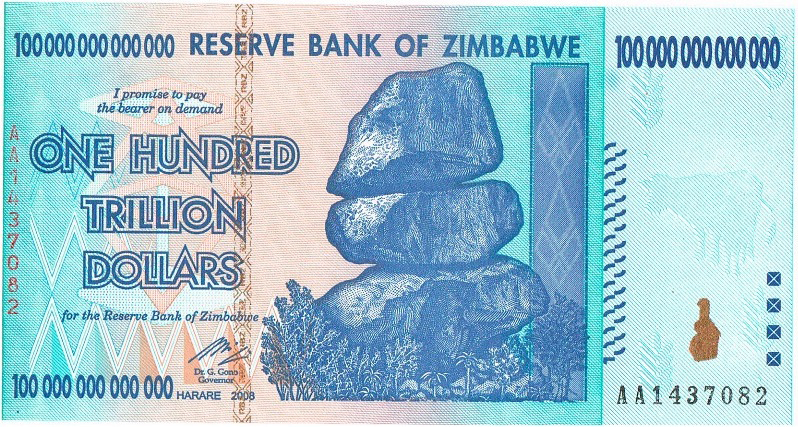 The Zimbabwe dollar is famous for being destroyed by hyper‑inflation. The government printed too much money. It’s so bad that when Zimbabweans get paid they try to immediately trade it for another currency because the value would drop percentages a day. It could drop by 10 percent over the course of an afternoon, and why would you want to keep that? You’d want to exchange it as fast as possible. A decentralized currency can potentially solve this kind of problem. No matter how it works in China, in the United States, in the UK, in any country, it does not matter, because individuals do not have control over it yet. With Bitcoin, it’s basically a global currency, and the people who have control over it is the Bitcoin network consensus. And this global consensus includes people with different ideological stances, different political agendas, different sexual orientations, different everything. The fact that people all over of many different shapes and sizes and beliefs can have a say in how that works… I think that has a value in itself. That’s never been done before. Dan: Would you say that distinction is the fundamental difference between all the other centralized currency? Dan: I never thought of that before, just that it wasn’t a government‑issued currency. But if the government doesn’t control it, who does? The people. It’s a radical departure from the way we’ve always done it. Ian: Right, because one of the ways governments exert power over their people is by controlling the money – having a monopoly on money is actually how I like to say it. That’d be the first step if somebody was going to start a new country. Of course, if I started one, I’d make it decentralized. But if a person wanted to exert control over a large group of people, if they’re smart, one of the first steps they should do is control the money supply. They should force them to pay taxes in that currency, et cetera. That’s a great way to exert power. Obviously. It’s proven wildly successful so far. Dan: It’s the standard way of doing business. Ian: Right. US citizens don’t think twice about using US dollars. Dan: Maybe they’re starting to now. A few of them, at least. Maybe they’ll use Dogecoin! Dan: Where would you point someone if they wanted to learn more about how money works? Books, blogs, what was helpful for you? Ian: Let me look this up. Always have trouble saying this…Is it Khan Academy? Ian: The Khan Academy has some excellent economics videos about how money works. That’s where I would direct them. Dan: Ok, last question. It’s a doozy. Let’s say in the near-future Bitcoin is accepted as currency by governments, merchants accept it as payment, and there’s an easy way for customers to facilitate transactions with merchants. It could be NFC, QR codes, or whatever. The infrastructure is all in place. It’s working. What then? What’s next? Where does it go? Is there anywhere to go after that? Ian: The real innovation behind Bitcoin is the block chain technology. It essentially creates decentralized trust. Besides the fact that it can revolutionize the idea of money and currency, it also starts to change how we communicate with other cultures. Afterall, one of the easiest ways to communicate with someone who doesn’t speak your language is to use their local currency. That barrier is lowered when everyone uses the same global currency. It creates a baseline of trust and communication. A block chain – decentralized trust – can revolutionize a whole bunch of other things as well. As it stands, Bitcoin represents proof of work – which has monetary value. Imagine if the block chain technology was used to provide proof of identity. Imagine if citizenship was decentralized and you could vote on global issues. You could take similar concepts and apply them to a whole bunch of different industries. The block chain basically allows you to decentralize and monetize anything. It does the same thing as Bitcoin does to money. It takes control away from central authorities and puts the power in the hands of the people. Imagine how revolutionary that is. That’s the next step. Dan: “Power in the hands of the people…” Why not literally? 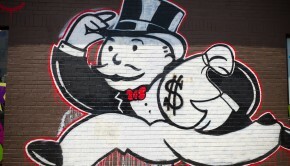 Big utilities have monopolies on energy, water, etc. You could apply the concept to those industries too. Ian: That’s a great one! You could put up a windmill and get your entire block to pay you in something like a PowerCoin. Dan: There would be a lot of infrastructure hurdles, but I see how the block chain could enable disruptive business models in this sector. In some ways, it turns any unit of work or value into a more easily traded currency. Ian: The TCP/IP protocol created the backbone of the internet, and in turn the internet enabled billion dollar industries. They just wouldn’t be here if it wasn’t for the Internet. The decentralized technology that Bitcoin has started to make popular… there are going to be other smart people out there that take that concept and revolutionize a million other industries that neither of us has thought about, yet. That’s what I think the next step is, but it’s not going to happen overnight. That’s next level talk, I guess. Dan: You put those ideas out there and they’ll eventually start happening. Ian: Why wouldn’t you do it? Earth is full of some really talented and smart people. Why underestimate them? Dan: I couldn’t agree more. 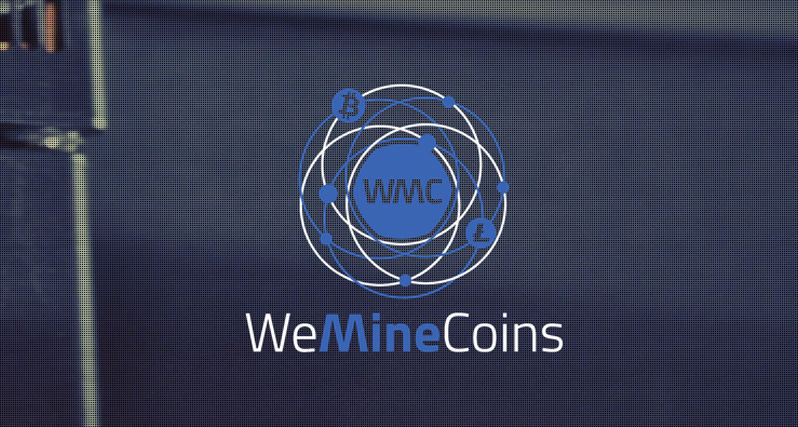 Learn more about Bitcoin mining at WeMineCoins.com.